Here is an approximate look at conditions Christmas Evening. Here are approximate conditions for 9pm December 25. Snow is falling, heavy in the red areas, to the west of the dashed purple line. Light snow in the blue areas, flurries in gray. 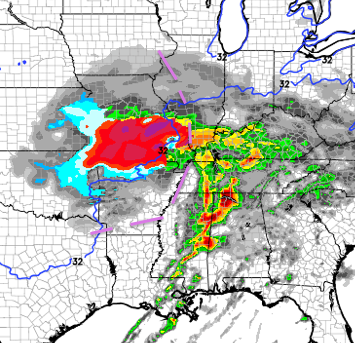 Thunderstorms are forecast to be progress from the lower Ohio Valley with violent thunderstorms from the Tennessee-Alabama-Mississippi border area on south. This is the significant tornado index forecast for 9pm. Values above 2 deserve your attention. 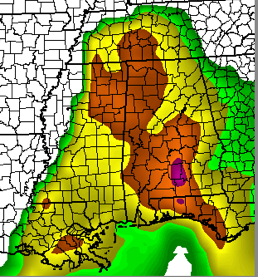 So, the thunderstorms depicted above certainly have the potential to produce tornadoes.